I was restless. I get that way sometimes. I talk about moving or taking a trip or rearranging furniture. That feeling of wanting to do something different than what’s happening right now clashes with my usual Type A personality. I can’t really explain it, but sometimes I just need to do something or go somewhere. I told my husband this Friday night. 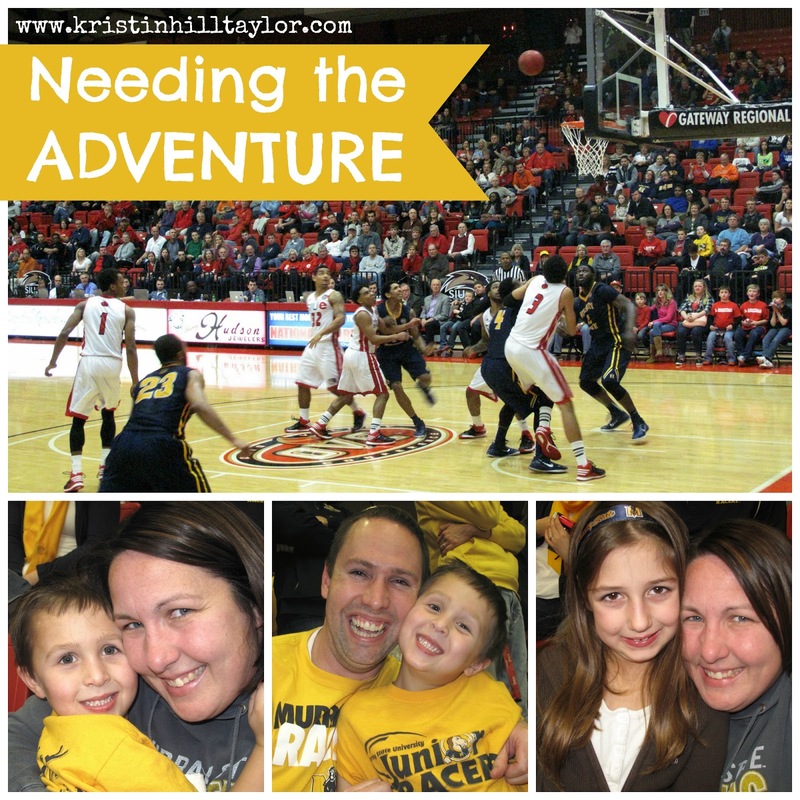 I mentioned maybe we should go to the Murray State basketball game on Saturday night – three hours away from our house. But it’s near where his brother and his family live. We talked about different scenarios and decided we’d decide in the morning. Saturday morning we made a plan that involved driving three hours to Edwardsville, Illinois, after lunch, meeting our relatives for dinner, cheering for our Racers, and then driving home. We left about 1 p.m. and returned home a little after midnight. I needed the socialization with people who aren’t in our everyday life. I needed the conversations with my husband that came while the kids were watching “Frozen” on the way up and sleeping on the way home. December and early January were filled with sickness around here. I’ve stopped filling every minute of my calendar. Everybody is finally well and being at home has been really good for my soul. But then I felt the itch for adventure. I needed to step away for a while – and that’s what a road trip does for me. Perhaps the emotional situation I’ve been walking through with my best friend prompted me to want to take a break. 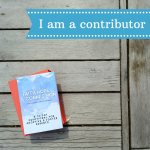 Perhaps this itch for adventure just part of who I am, despite my usual Type A ways of wanting a plan – and I’ve finally realized my personality can’t be boxed up. Regardless, I’m glad I’m grown up enough to recognize when I just need to take care of my soul. 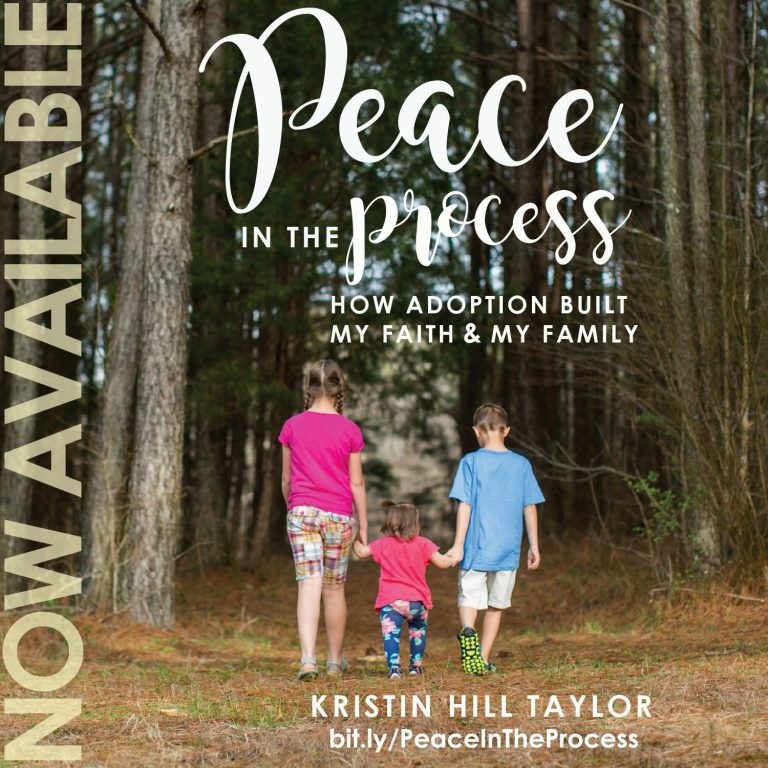 Other notes :: My ebook, “Peace in the Process: How Adoption Built My Faith & My Family,” is on sale for just 99 cents for a few more days. And today’s the last day to enter to win a copy of “Mothering from Scratch: Finding the Best Parenting Style for You and Your Family” by Melinda Means & Kathy Helgemo. Kristin – Look at those faces in the photos – an adventure was exactly what you all needed 🙂 The most cherished times with our kids took place in our cars – on those adventure rides. Funny to read this just now….I am taking a ride with my mom this morning (necessary & not by choice), after the snow storm we had yesterday. She wants to cancel. I said,"No, we're going on an adventure!" So I loved reading this. Blessings! Love the pictures of your beautiful family! It looks like everyone had a great time. I get restless too. Sometimes it drives my husband a little crazy :). I completely agree on those great talks in the car. We have had some of our best on short road trips. You have such a cute family Kristen. Your road trip sounded awesome. We used to do road trip when I was a kid. It gave me the love for travel and adventure. My parents would never tell us where we were going. My dad would just say "Let's go for a ride!" Have a great week! I love that you connect "growing up" with a deeper understanding of yourself and your needs. I'm learning that, too. Growing up is not a lack of restlessness- it's responding correctly to it. Thank you for this thought-provoking message. I'm restless, too. But reading your words quieted my soul a bit. You are a blessing. We all need a little adventure in our lives. It keeps things interesting. Glad you are all feeling better. We are going through that too. I can so relate to this post – we've just gone through the exact same thing with sickness and being homebound for a while. It wasn't our whole family but Sophie and I were able to go to a figure skating exhibition and just to get out of the house and into a different arena was sooooo wonderful. We were sort of obnoxious we were so excited to be out. explain it, but sometimes I just need to do something or go somewhere." It made me smile. :) Have you considered having a "Three Word Wednesday" tab on the top of your blog? I love this post. you had me with the word adventure. I just love me a good adventure. Sometimes I think that is the best thing for our soul. I am praying your kiddos stay sickness free and you get to enjoy more adventures!! A TWW tab is a fabulous idea. Thanks for the suggestions. Glad you got out too. I hope everybody at your house stays well! Glad you're here, Melody! Hope y'all get well and stay well. It will pass! We aren't very good secret-keepers around here when it comes to family stuff, but my husband, mother-in-law and I surprised the kids with a Disney trip in October. They didn't even know we were going anywhere and then we loaded them in the car and told them we were going to Disney World. It was such a fun moment. And a fun trip. I should embrace that surprise factor more often. We've been taking our kids on trips since they were born, and I'm so glad we do. Sure, sometimes it's more complicated, but it's such a joy to explore and travel together. Hope you had a great adventure today! All four of us are extroverts, but I'm the one the most introverted tendencies, so sometimes my husband wants to keep going and doing and I'm like, "Hey, let's stay home." 🙂 Hope you get a good car talk soon too! You're such a encouragement, Karen. I'm glad you found some encouragement here. I'm so grateful God continues to teach us and show us things, even about ourselves. Life certainly is a process. Oh I get that sense of adventure. There is nothing like a change in scenery to help you to refocus and renew especially in the middle of winter. Great story. Thanks for hosting the linkup! Blessings! Thanks, Mary! I'm glad you're here! 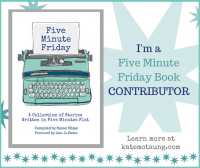 Kristin…I 100% relate to this – that restlessness that settles in and makes you want to jump right out of your seat. I'm a certified Type A too so being spontaneous isn't exactly my wheelhouse, but God has helped me to let go more and just enjoy the ride. Not that I don't get incredible antsy and impatient during the ups and downs, but I can take them more in stride. Thanks for sharing real words!